BÜHLMANN fCAL® turbo is for Research Use Only in the US. Not to be used in diagnostic procedures. 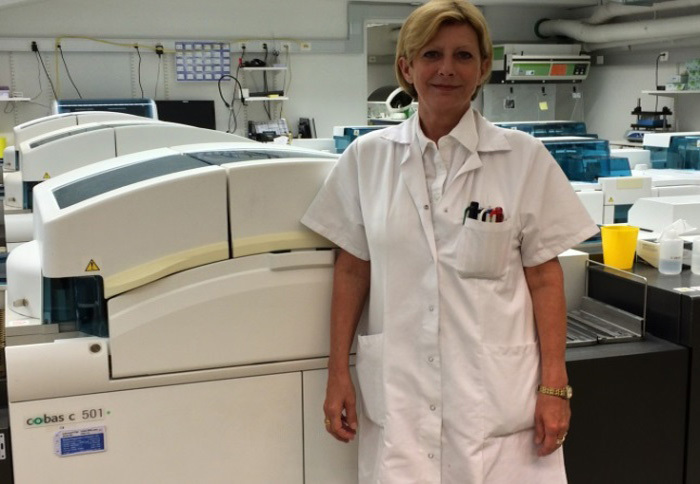 Mrs. Schallberger, you recently decided to introduce the new calprotectin assay, BÜHLMANN fCAL® turbo, which offers a calprotectin result in random access mode on all USUAL clinical chemistry analysers within 10 minutes? The gastroenterologists of the St. Anna Hospital wish for their patients calprotectin result as fast as possible, at any time of the day. By introducing BÜHLMANN fCAL® turbo we can finally provide the service they longed for, as well as improving the service of calprotectin determination for the resident doctors. Concerning the lab work, the introduction of the BÜHLMANN fCAL® turbo has significantly simplified our daily routine due to the high degree of automation compared to ELISA. We now can perform calprotectin determinations at any time of the day with much less workload and receive results much faster, as the whole procedure including the preanalytic extraction of the stool sample in less than 30 minutes altogether. You perform the BÜHLMANN fCAL® turbo assay on the Roche cobas® c501 for some months now. How was the setup of the test onto the cobas® c501 and how is the performance of the fCAL® turbo assay in daily routine? The set up onto the Roche Cobas® c501 went very quickly and without any problems. The Roche Diagnostics and BÜHLMANN application specialists did the set up and installation of the validated protocol within half a day. In daily routine, the test is very robust and very reliable. Also the controls perform with high precision and are always found in the defined target range. You perform stool extraction by using the CALEX® Cap extraction device from BÜHLMANN. What do think about its handling and application onto the Roche Cobas® c501? The handling of the CALEX® Cap is excellent. It is extremely easy, fast and safe to use. It runs without any problems on the Roche cobas® c501 and the additional possibility to pipette 10 ul of the sample into the CALEX® Cap device when samples occasionally are liquid is just great. The CALEX® Cap is by far the best stool extraction device that I have ever used so far. Have you ever had to experience interferences with other clinical chemistry tests because of using stool extracts with the CALEX® Cap on the cobas® c501 system? No. we haven’t. As you know we have been working for many months with the test in daily routine and we have never had any interferences or problems with other clinical chemistry tests when using CALEX® Cap stool extracts on the cobas® c501. You have shown in an evaluation-study that it is possible to also measure the ScheBo®Pankreas Elastase out of the very same CALEX® Cap stool extract. Do you see this as a significant advantage? Yes indeed. When you can perform two different tests out of the same extract you also safe time and costs. This is also an advantage when two tests out of a very small sample are requested. Before introducing fCAL turbo, you used the BÜHLMANN fCAL® ELISA for a long time. How did the tests compare when you did the method comparison during evaluation? The assay correlation and the agreement of the results were very high. It was nice to see that the tests are standardized identically. Are you satisfied with the service and support by BÜHLMANN? Service and support are great, be it technical or application support, as well as sales. I would also like to specifically mention the delivery and logistics which is excellent as well.